perfect paper for a perfect picture!! loving fall and the wonderful colors it brings with it!! Great way to work this paper! I like how you improvised with your journaling too! This is GORGEOUS!!! I loveeeeeee that photo, the title on its side and loveeeeeeeee the trees in the background!!! If I don't have the room ... I take a journal tag -- fill out what I want to say... and then adhere it to the back :) Happy Halloween!!! what an amazing photo! love how you scrapped it! Love the layering- creative way to include the journaling. Lovely photo!! wow! perfect paper. love the fun!! Lisa, I seriously opened this page and gasped! I love the way you worked with those trees and the vellum spot for journaling is so clever! Fabulous LO!! Love all the layers and embellishments, and I love the vellum journaling spot too--great design! Love, love love this-that journaling on vellum on the photo is genius! Great LO! I like how you added the journaling. 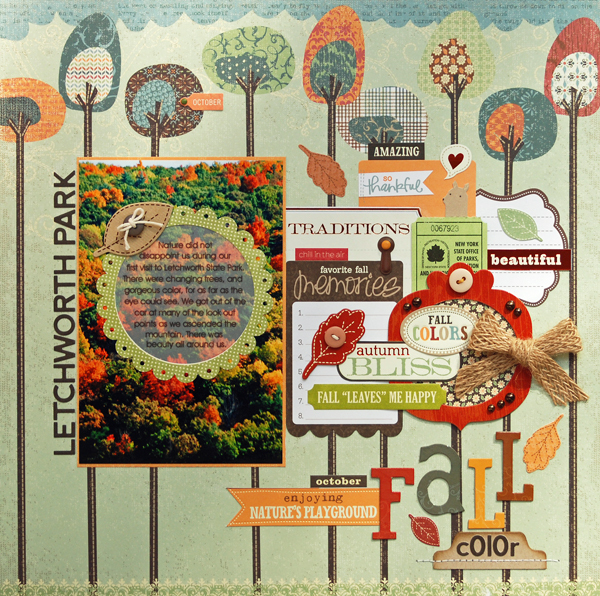 Very pretty fall foilage layout. You did such a great job with this difficult paper. I wouldn't have known how to use this side and would have opted for side B for sure!! Very creative with the journaling. I found myself without a spot for journaling on the last layout I did! !